When you get a tattoo, obviously it’s permanent. Many either want their tattoo to have a deep meaning to them, or just get it randomly for a fun new memory. Getting ink on your body can be a huge decision because it will be on your body for the rest of your life. Everyone who gets a tattoo has a different story, but not all agree with the idea of tattoos, especially some parents. Getting permanent ink today has been normalized compared to when current parents were growing up. In today’s world 38% of people between the ages of 18-29 have at least 1 tattoo. Some will not hire you if you have a tattoo in a visible place. There are many standards today about what you can and can’t do with your own body. However, some stand up for that by expressing themselves through the art they want on their body. It has become known that many teens are getting tattoos today. Students at Pennridge High School were interviewed. Ava Bratina states, “I think tattoos are becoming more casual. They used to be such a bigger deal than they are today, but now they are becoming more accepted in society.” She has one tattoo and she got this because of a memory she had with her father. Makenna Patterson was also interviewed. She stated that her father used to have a problem with it. Now, as long as it has meaning he has no problem with it. Many parents are against the idea of letting their child get permanent ink on their body. A meaningful tattoo is more accepting. However, most people in today’s generation have no objection with others getting tattoos. If they do not have one, most just either do not feel the need to get one or are scared it will hurt and do not think the pain is worth it. In conclusion, you need to have your parent’s permission before you turn 18 to get a tattoo. 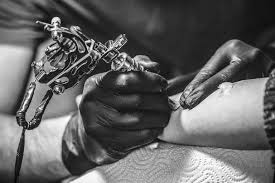 Once you are 18, you are legally eligible to get a tattoo alone. I agree with this because you can live on your own and have to take care of yourself. Your body is your body and no one else’s. You should be able to do what you want with your body, especially considering you are not hurting anyone else. Next time you think about getting a tattoo, think through what you want on your body for the rest of your life. Do you want a meaningful tattoo or art you can have and add to during your life? Whatever you do, just remember that this ink is permanent and is painful to get removed.